When a customer makes a payment to your organization, you can easily add it to Operate by going to Invoicing > Accounts Receivable and accessing your customer’s page. Simply click your customer’s name in the list to do so. On this page, you will find a Payment button. Click it to get started. Select the Date when the payment has been received. Enter a Reference for your payment. This will be visible on your accounts receivable screen and will represent the title of your transaction. Select the payment type that has been used to process this payment. Notice that the amount is being displayed below, as un-allocated You will need to allocate the sum to an outstanding invoice below. To allocate the amount paid to an invoice, find it in the list below, and enter it under the corresponding column. the sum will be automatically deducted from the de total. If that particular invoice has been paid in full, you can simply click Allocate to allocate the amount to it. You can allocate the entire amount you have entered above to one invoice or split it into smaller amounts and allocated to multiple invoices. 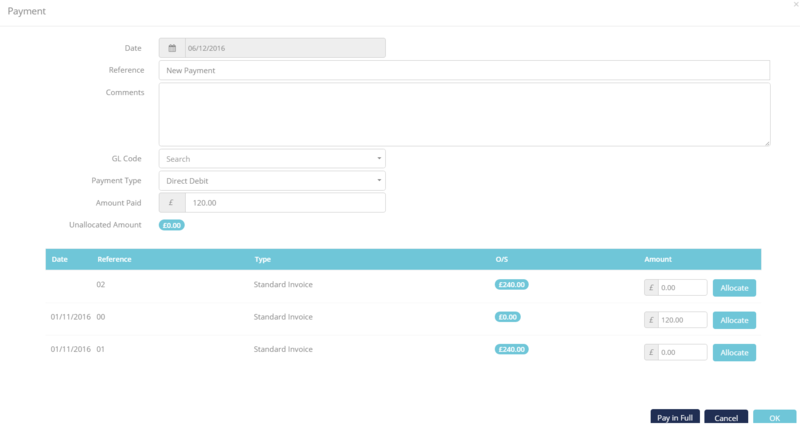 If a customer pays all of their outstanding invoices in full, you can use the Pay in Full button which will automatically allocate the full due amounts.